DataGrid, similarly to the Table component, is designed to display and sort tabular data, and provides means to manipulate rows and columns with greater performance due to lazy loading of data while scrolling. XML name of the component: dataGrid. In the example above the id attribute is a column identifier, and the property is the name of the entity attribute from the data container that populates the column with data. id - an optional attribute with the column identifier. If not set, the string with the property value will be used as the column identifier. In this case setting the property value is mandatory, otherwise the GuiDevelopmentException exception will be thrown. The id attribute is still mandatory for the columns created in the screen controller. caption - an optional attribute containing the column caption. If not specified, a localized attribute name will be displayed. expandRatio - sets the column width ratio. By default, all columns have equal width (i.e. expandRatio = 1). If another value is set for at least one column, all implicit values are ignored, and only set values are considered. collapsed - an optional attribute; hides the column by default when set to true. The default value is false. collapsingToggleCaption - sets the column’s caption in the sidebar menu. By default its value is null, in this case the caption remains the same as the column’s caption. resizable - defines whether a user can change the column’s size. sortable - an optional attribute to disable sorting of the column. Takes effect if the whole DataGrid has sortable attribute set to true (which is by default). width - an optional attribute controlling default column width. May contain only numeric values in pixels. minimumWidth - sets the minimal column width in pixels. maximumWidth - sets the maximal column width in pixels. actions - optional element to define actions for DataGrid. Besides custom actions, the standard actions from the ListActionType enumeration are also supported: create, edit, remove, refresh, add, exclude. buttonsPanel - creates a ButtonsPanel container with action buttons above the DataGrid component. rowsCount - optional element that creates a RowsCount component for the DataGrid. RowsCount enables pagination of data, the page size is set by limitation of records in the data loader with the help of CollectionLoader.setMaxResults() method from the screen controller. Another way to do this is to use a universal Filter component bound with the same data container as the DataGrid. The RowsCount component can also display the total number of records returned by current data request without loading these records. When a user clicks the "?" button, it calls the com.haulmont.cuba.core.global.DataManager#getCount method that passes to the database a request with the same parameters as current but with COUNT(*) aggregation function instead of getting results. The returned number is displayed in place of "?" symbol. ANIMATED - the columns size follows the mouse when dragging (default mode). SIMPLE - the columns size is changed after the dragging is finished. The column size changes can be tracked with ColumnResizeListener. The origin of the column size changes event can be tracked using isUserOriginated() method. columnsCollapsingAllowed - defines whether a user can hide columns in the sidebar menu. Displayed columns are checked in the menu. When a column name is checked/unchecked, the value of collapsed attribute of each column is updated. When set to false, the collapsed attribute of any column cannot be set to true. The column collapsing changes can be tracked with ColumnCollapsingChangeListener. The origin of the column collapsing event can be tracked using isUserOriginated() method. contextMenuEnabled - enables turning on and off the context menu. Default value is true. The right mouse clicks on the DataGrid can be tracked with ContextClickListener. editorBuffered - sets the buffered editor mode. The default mode is buffered (true). editorCancelCaption - sets the caption on the cancel button in the DataGrid editor. editorEnabled - enables the item inline editor UI. Default value is false. If dataGrid is bound to KeyValueCollectionContainer or ValueCollectionDatasource, it is supposed to be read-only, and editorEnabled attribute becomes nonsense. editorSaveCaption - sets the caption on the save button in the DataGrid inline editor. frozenColumnCount - sets the number of fixed DataGrid columns. The 0 value means that no columns will be fixed except the predefined column with checkboxes for multiple choice if the multiselect mode is used. The -1 value makes even multiselect column not fixed. headerVisible - defines if the DataGrid header is visible. The default value is true. reorderingAllowed - defines whether a user can change the columns order by dragging them with a mouse. The default value is true. The column order changes can be tracked with ColumnReorderListener. The origin of the order change event can be tracked using isUserOriginated() method. SINGLE - single record selection. MULTI - multiple selection as in any table. MULTI_CHECK - multiple selection using the embedded column with checkboxes. NONE - selection is disabled. Rows selection events can be tracked by SelectionListener. The origin of the selection event can be tracked using isUserOriginated() method. sortable - enables or disables the DataGrid sorting. The default value is true. When the sorting is enabled, the click on the column name will display the sorting icon to the right of che column caption. Sorting of any specific column can be disabled by this column’s sortable attribute. The DataGrid sorting events can be tracked by SortListener. The origin of the sorting event can be tracked using isUserOriginated() method. textSelectionEnabled - enables or disables text selection in the DataGrid cells. The default value is false. getColumns() - returns the current set of DataGrid columns in their current display order. getSelected(), getSingleSelected() - return instances of the entities corresponding to the selected rows of the table. A collection can be obtained by invoking getSelected(). If nothing is selected, the application returns an empty set. If SelectionMode.SINGLE is set, it is more convenient to use getSingleSelected() method returning one selected entity or null, if nothing is selected. getVisibleColumns() - returns the current set of visible DataGrid columns in their current display order. ANY - scroll as little as possible to show the required record. START - scroll to place the required record in the beginning of the DataGrid visible area. MIDDLE - scroll to place the required record in the centre of the DataGrid visible area. END - scroll to place the required record in the end of the DataGrid visible area. scrollToStart() and scrollToEnd() - scroll the DataGrid to the top and to the end respectively. setCellStyleProvider() - enables setting the DataGrid cell display style. setRowStyleProvider() - enables setting the DataGrid row display style. The action defined by the setItemClickAction() method. The action assigned to the Enter key by the shortcut property. If such action is found, and has enabled = true property, the action is executed. Item click events can be tracked with ItemClickListener. ASCENDING - ascending (e.g. A-Z, 1..9) sort order. DESCENDING - descending (e.g. Z-A, 9..1) sort order. setDescriptionProvider() method is used to generate optional descriptions (tooltips) for the cells of individual DataGrid columns. The description may contain HTML markup. setRowDescriptionProvider() method is used to generate optional descriptions (tooltips) for DataGrid rows. If a column description provider is also set, the row description generated by provider is used for cells for which the cell description provider returns null. 1 – See the createCloseButton method description in the DataGridDetailsGeneratorSample class. 2 – See the getContent method description in the DataGridDetailsGeneratorSample class. The DataGrid component has an API for inline editing of records in the cells. When an item is being edited, the inline edit UI with default save and cancel buttons is displayed. getEditedItemId() - returns the id of the item that is currently being edited. isEditorActive() - returns whether an item is currently being edited in the editor. editItem(Object itemId) (Deprecated) - opens the editor interface for the provided item id. Scrolls the Grid to bring the item to view if it is not already visible. edit(Entity item) - opens the editor interface for the provided item. Scrolls the Grid to bring the item to view if it is not already visible. addEditorOpenListener(), removeEditorOpenListener() - DataGrid editor open listener. This listener is triggered by a double click on the DataGrid area that instantiates the inline editor and enables to get the fields of the edited row. This enables to update some fields depending on other fields' values without closing the editor. addEditorCloseListener(), removeEditorCloseListener() - DataGrid editor close listener. addEditorPreCommitListener(), removeEditorPreCommitListener() - DataGrid editor pre commit listener. addEditorPostCommitListener(), removeEditorPostCommitListener() - DataGrid editor post commit listener. The changes are committed to the data source or data container only. 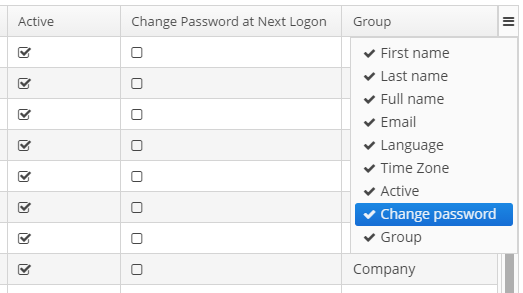 The logic to save these changes in the database should be added separately. the type of value - common for the whole column. ColumnGeneratorEvent, passed in the getValue method, contains information on the entity, displayed in the current DataGrid row, and the column identifier. By default, the generated column is added to the end of the table. There are two possible ways to manage the column’s position: either using an index in the code or adding a column in advance in the XML descriptor and pass its id to the addGeneratedColumn method. When the field type does not match the data type that can be processed by a renderer, one can create a Function to match data types of the model and the view. For example, to display a boolean value as an icon, it would be handy to use the HtmlRenderer to display HTML layout and implement the logic to convert a boolean value to the layout for icons' display. passing a renderer interface to the fabric method of the DataGrid interface. Suits for GUI and Web modules. For the moment this way is suitable only for the Web module. TextRenderer - displays plain text. HtmlRenderer - displays HTML layout. ProgressBarRenderer - displays double values between 0 and 1 as a ProgressBar component. DateRenderer - displays dates in the defined format. NumberRenderer - displays numbers in the defined format. ButtonRenderer - displays string values as a button caption. ImageRenderer - uses the path to an image to display the image. CheckBoxRenderer - displays boolean values as a checkbox icon. HeaderRow and FooterRow interfaces are used to represent header and footer cells respectively. They can be a merged cell for multiple columns. appendHeaderRow(), appendFooterRow() - adds a new row at the bottom of the header/footer section. prependHeaderRow(), prependFooterRow() - adds a new row at the top of the header/footer section. addHeaderRowAt(), addFooterRowAt() - inserts a new row at the given position to the header/footer section. Shifts the row currently at that position and any subsequent rows down incrementing their indices. removeHeaderRow(), removeFooterRow() - removes the given row from the header/footer section. getHeaderRowCount(), getFooterRowCount() - gets the row count for the header/footer section. setDefaultHeaderRow() - sets the default row of the header. The default row is a special header row providing a user interface for sorting columns. setStyleName() - sets a custom style name for this cell. getComponent(), getHtml(), getText() - returns the content displayed in this cell depending on its type. Below is an example of DataGrid the header that contains merged cells, and the footer displaying calculated values.